If you are a die-hard fan of Zecharia Sitchin, or are curious about his controversial theories regarding the planet Niburu and its divine denizens, you will love DNA of the Gods by Chris H. Hardy, Ph.D.
Sitchin was a prolific writer and effectively promoted his well-thought-out interpretations of ancient Sumerian records and lore. To their credit, those who assumed his mantle after his passing in 2010 have done an awesome job of keeping his legacy alive, re-framing his ideas to keep them fresh and enriching the canon by adding their own keen insights and understandings to those of the maestro. In DNA of the Gods Dr. Hardy starts by distilling the essence of ten of Zecharia’s books. Armed with this, and a thorough understanding of Gnostic writings, she makes an iron-clad case for Enlil being the God of Genesis and Enki being the Serpent in the Garden. Then she sheds an incredible amount of light on the biblical narrative and other ancient Near Eastern accounts. Enki, along with Ninmah and Ningishzidda, are literally our creators and divine parents. Though we were initially designed to serve as sterile and disposable slaves our creators nonetheless protected us from the wrath of Enlil, who sought our utter annihilation on several occasions. The gift of sexual reproduction was eventually granted to humanity in order to inexpensively generate new batches of short-lived servitors. It was much cheaper than constantly creating new clones. An unforeseen effect was that the sexual ecstasy of humans opened doors to levels of consciousness beyond those accessible to our masters. This power was especially potent in human women. Through the mastery of certain practices, we could free ourselves from the shackles of this world and help liberate the Anunnaki as well. This gift made us dangerous to the God who wished to totally control his own people and keep us enslaved. Using Far Eastern and Canaanite sources, Chris Hardy demonstrates the true nature and great power we all possess. She also reveals why extremes forms of misogyny are practiced and perpetuated in the name of God and the cultural institutions He inspired and endorses. These revelations, though startling, explain quite a lot. They also reveal that our fierce inner struggles with raging emotions are largely due to the DNA of the Gods that courses through our veins. Of special interest to me was Chris Hardy’s informed assertion that Ningishzidda is Hermes/Thoth. As I am a student of Hermetic lore this flash of insight reconfigured all I thought I knew and arranged it into much more interesting configurations. 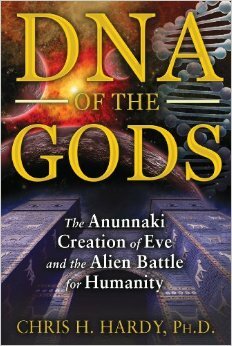 DNA of the Gods advances the Ancient Alien literature and hints of exciting new horizons ahead. It is the perfect companion volume to Wars of the Anunnaki. Two volumes and I’m already a fan of the author and her work. Keep those sequels coming Inner Traditions/Bear & Company!